Last night, I watched the Eagles preseason opener against the Bears at a crowded bar, and it reminded me why I don’t watch Eagles games at crowded bars. It was great to catch up with some of my high school friends who I hadn’t seen in quite some time, but it is impossible to really focus on the details of a game at a place like that. I ended up listening to Merrill Reese on the radio for the first 10 minutes while doing 20 laps in my car around the parking lot looking for a space. I’ll stop now, I promise. 14:55 — Scott Graham just called Allen Barbre, “Allen Barber.” I have a feeling a lot of announcers will make that mistake during the first four games. The less they do, the better, because it means Barbre will have done his job and gone unnoticed. 14:01 — The Bears have to call timeout after two completions from Nicky. Can I call you Nicky? I feel like I can call you Nicky occasionally after I wrote this about you. 13:55 — Man, it feels like Lance Briggs has been on the Bears forever, doesn’t it? 13:30 — Foles intercepted. Did not hear this on the radio last night, but Brian Baldinger says the pass was tipped, and I agree. Not a great read by Foles but also don’t know where the pass was originally intended. 11:59 — Nice to see Mychal Kendricks just dropped in coverage and looked alright doing it. Good stuff. 11:50 — Nice field goal block by Damion Square. Not sure he makes the team here but has that on his resume now. 3:24 — Touchdown Bears. Baldy says it was good coverage but looked like DeMeco Ryans never got his head turned around to look for the ball. 3:18 — First ball blows off the tee before the kickoff of the year! We rollin now. 3:10 — Baldy just called Barbre “Barber” now too. Make it stop. 2:40 — Jeremy Maclin catches a pass. First time he did that since December 30, 2012. I want to say something witty here about how times have changed since then, but I’ve got nothing. Sorry, folks. 1:00 — Foles intercepted again. You probably haven’t heard this stat yet, but that equals the number of picks he threw last regular season. :50 — Nice tackle by Najee Goode. The lack of depth at inside linebacker is an underrated concern in my opinion. Hopefully he can ease some of it. 15:00 — Vinny Curry hungry. 13:50 — ZACH ERTZ, MY DUDE. Big second year leap coming for him this season. Mark it down. 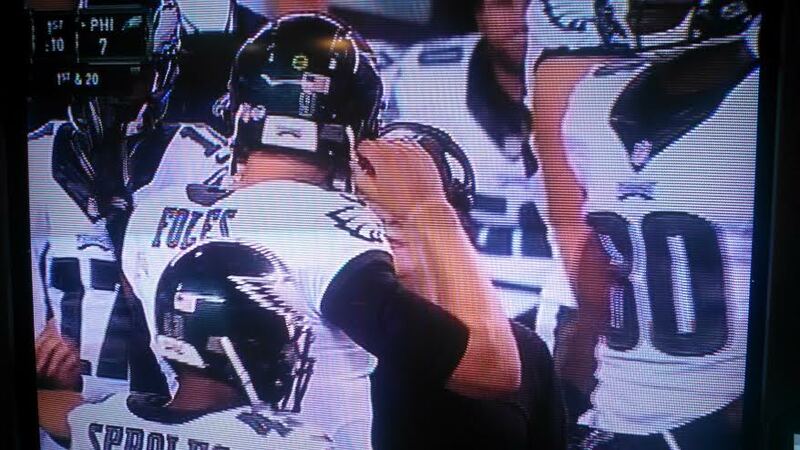 12:50 — Donnie Jones in midseason form, pinning the Bears on their own 10 yard line. 12:00 — Bad missed tackle by Earl Wolff there. Billy Davis can’t be thrilled. 10:47 — Ertz again with a nice reception. Last year, my dad never really bothered to learn his name. Every time he caught a pass, he would ask “Is that the kid from Stanford who they got playing for em’?” Expecting to hear it a lot this year. 9:38 — Eagles score, Matthew Tucker. Running out of the spread seems to have caught the Bears off guard. Nice push from potential backup center David Molk. This is just weird, but I think I can get used to it. 9:30 — Welcome, Chris Maragos. Nice tackle on the kickoff. 8:15 — Marcus Smith outchea batting down a pass to get the defense off the field. Good to see. 7:32 — I’m trying to watch Lane Johnson against the twos. 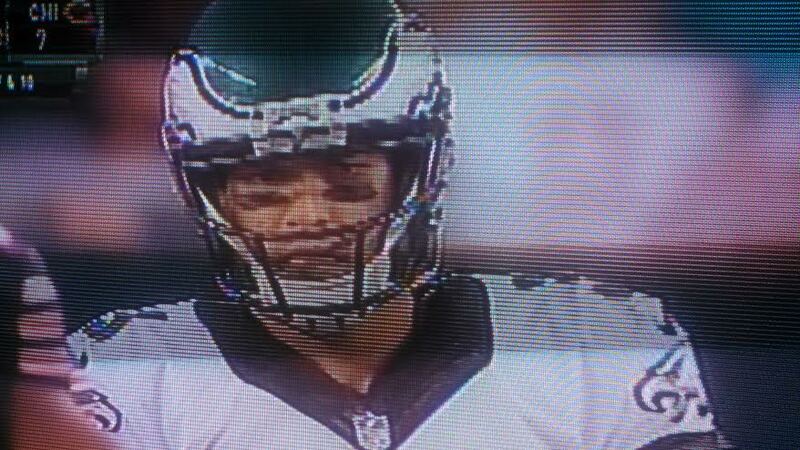 Think he looks good, but Mark Sanchez and Tucker are making it tough to pay attention with these dynamic plays. 5:52 — Tucker scores again. I realize it’s the preseason against fellow backups, but the bottom of this Eagles roster is the best it has been in quite some time. I imagine a few guys who get cut will hook on elsewhere. 5:50 — Baldy mentions DeSean Jackson. To my knowledge, this is the first time his name has been dropped tonight. 5:50 — Alex Henery puts the kickoff into the end zone. Whoa. 5:27 — Defensive line coach Jerry Azzinaro just seems like a fun guy to play for. 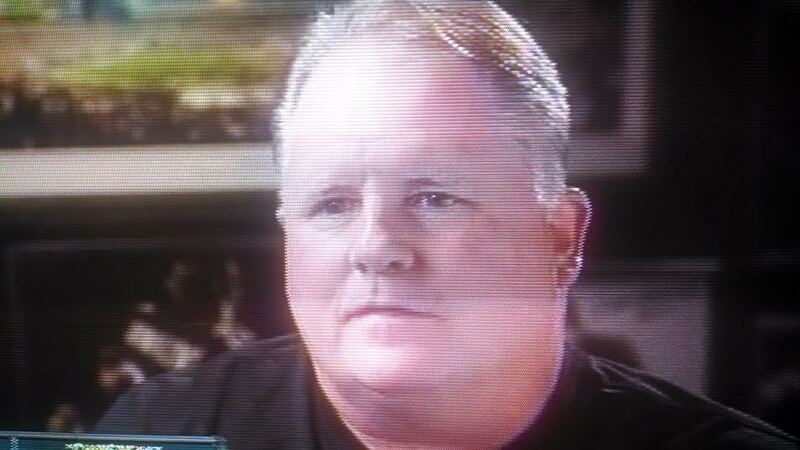 One of Chip’s Oregon guys and glad he brought him along. 5:15 — Defensive holding negates the impact but nice coverage and tackle by Smith in space. 1:07 — Touchdown Bears. Marc Trestman has found a mismatch with Zach Miller against the Eagles linebackers in coverage, and he likes it. There is a minute left in the half and the Eagles have three timeouts left. 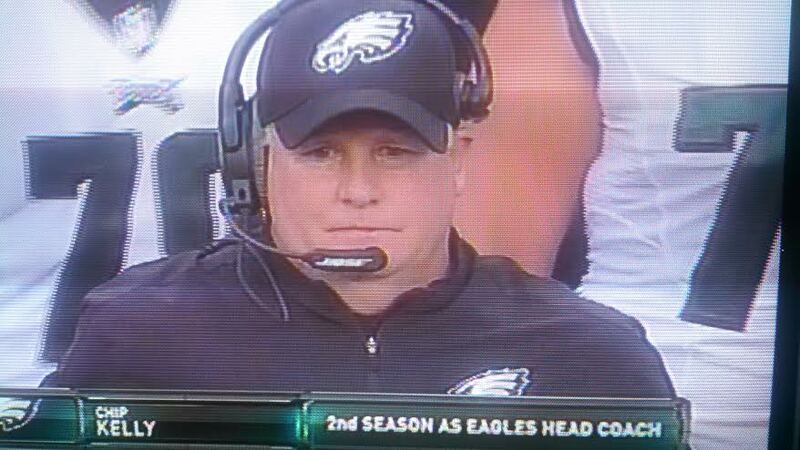 Insert some joke about Andy Reid here. :54 — JOSH HUFF GOES 102 YARDS FOR A TOUCHDOWN! Last night, I thought he pulled a DeSean circa 2008 and dropped the ball before crossing the plane but nope, he good. :49 — Only a yard deep that time, but Henery still puts the kick in the end zone. Could be worse. :31 — Almost 10 minutes have elapsed since I last typed something. This is the longest end to the first half ever, but I love Chip using the aforementioned timeouts to try to get the ball back. Aggressive football. 15:00 — Henery puts another one in the end zone. Not bad. 14:55 — Jimmy Clausen sighting for the Bears. I automatically think of this upon seeing his name. 11:20 — Tucker fumbled, Clausen got nowhere, and Robbie Gould made a field goal. 21-17 Eagles. 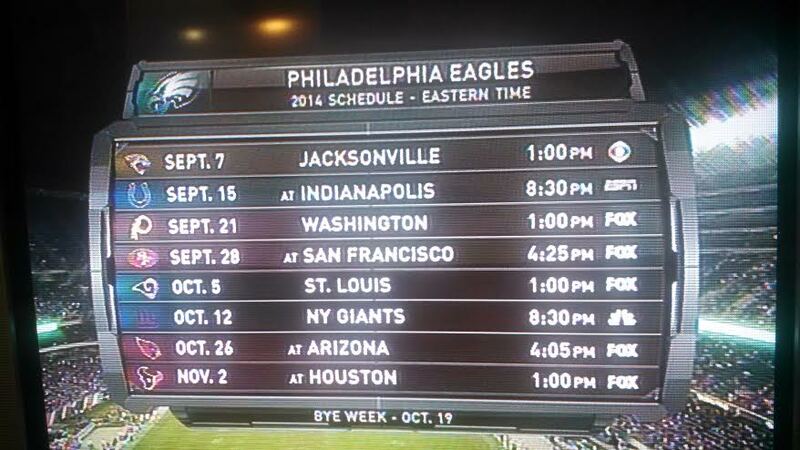 It seems like things bout to get unwatchable. 11:16 — Bad kickoff return by Huff that time. Didn’t even make it to the 10 yard line. 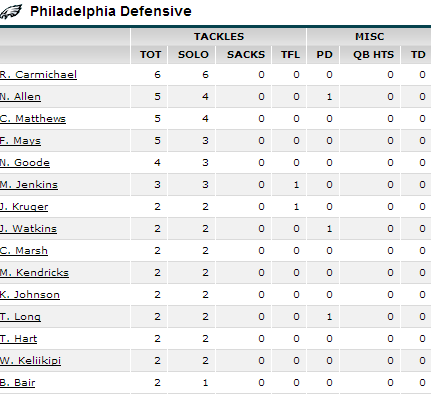 One thing of note here, pretty sure I saw Marcus Smith playing special teams there. Will be interesting to follow. 8:51 — Couple of good balls from Barkley including an out to Will Murphy down the right sideline showing off some decent arm strength. Another nice pass to Jordan Matthews on the left, but the rookie drops it. 7:02 — Screen game, David Fluellen. 28-17 Eagles and some boos heard at Solider Field. I love Chicago, awesome city, but they’re probably still a bit salty over this. 6:50 — I went to go get some grapes during the commercial, but I see Henery had another touchback. Nice. 6:04 — Touchdown Bears. Jaylen Watkins burnt in a welcome to the NFL moment for the fourth round rookie. 5:59 — Obligatory reminder that Damaris Johnson is still on this team for another couple weeks. 5:27 — Bad drop by Matthews, not exactly helping Barkley out here. Birds have to punt. 5:09 — Turnovers on back-to-back plays. Bears fumble a punt return and Barkley gets intercepted. Seen some good stuff out of Barkley but think my slim hopes of him taking the backup job from Sanchez have just left town. 4:15 — Clausen should have been called for intentional grounding. He wasn’t, and the Bears get a first down on a screen pass the very next play. 1:29 — Touchdown Bears, lead Bears. Watkins got picked on pretty good during that drive. 31-28.
:26 — Barkley seems to like Casey. Nice third down completion over the middle to extend the drive. 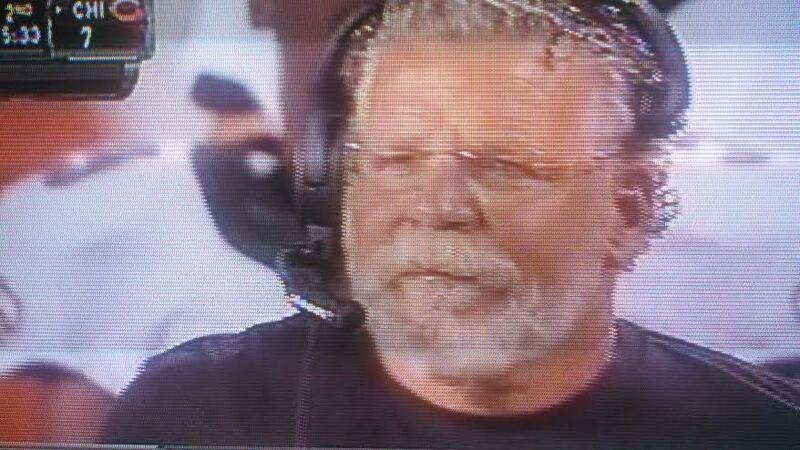 It just dawned on me that I’m spending 1/8 of my Saturday watching a football game that isn’t even live. Send help. 14:50 — Barkley slips and misses an open Huff who seemed to be sitting in the Bears zone. Cue a punt. 14:15 — Roc Carmichael seems like a good guy. He’s not a good NFL cornerback however. Beat deep again. 12:13 — Watkins interception! Don’t be fooled if you only look at a box score. He had a rough night, but I imagine that made the pick feel even better. 10: 56 — G.J. Kinne time. He appears to enjoy throwing to Johnson, a former Tulsa teammate. 9:45 — Jones touchback. Looked like Watkins may have had a shot to down it, but either way, you don’t see that too often. Only five in 82 punts last season. It just occurred to me that I forgot to start Corey Kluber on my fantasy team today. Dammit, Drew. I’m in first place but gotta be better than that. 8:11 — Bears convert a 3rd and 11. These are backups in the fourth quarter of a preseason game, but that’s one area where the Eagles defense needs to be better this year. I didn’t watch the guy as much as I wish I did to point out specific plays, but I don’t want to go the whole post without mentioning him: Beau Allen seemed to take advantage of Bennie Logan sitting this one out with a solid game. 5:01 — I’m still here folks, I promise. You gotta realize what I’m working with here trying to blog about the fourth quarter of an NFL preseason game. 3: 46 — Journey’s “Don’t Stop Believin’ is playing during a timeout. Used to really like that song before it got ridiculously overplayed. 3:30 — Solider Field goes wild for local product Jordan Lynch as he runs for a first down. According to Wikipedia, he and I share a birthday, so he’s cool in my book. 2:50 — Between all of the offensive holding penalties early and a personal foul on Bryan Braman there, birds not exactly disciplined in their play tonight. This graphic appears on the broadcast before the two minute warning. Please get here soon. 2:00 — Graham is on the field. For as much as some think he won’t make it out of camp, I hope the Eagles keep him around as another pass-rusher. Even though you have me blocked on the Twitter machine, I’m pulling for you. 1:58 — Gould adds a field goal to make it 34-28. We unfortunately won’t see Henery attempt any tonight. 1:49 — Kinne has to go 79 yards in under two minutes. Back in 2001, A.J. Feeley made the team by pulling off a similar situation. :50 — Kinne has the Eagles more than halfway there to the 37 yard line. Let’s see what you got, kid. :02 — Hail Mary time. Ball spotted on the Chicago 33.
:00 — Kinne rolling to his left and falling down off his back foot completes a pass to Quron Pratt just inside the red zone but time expires. Game to Chicago. It was fun, Bears. Let’s do it again next August. This entry was posted in Uncategorized and tagged A.J. Feeley, Alex Henery, Allen Barbre, Andy Reid, Beau Allen, Bennie Logan, Billy Davis, Brandon Graham, Brian Baldinger, Bryan Braman, Chicago Bears, Chip Kelly, Chris Maragos, Corey Kluber, Damaris Johnson, Damion Square, David Fluellen, David Molk, DeMeco Ryans, DeSean Jackson, Don't Stop Believin, Drew Balis, Earl Thomas, Earl Wolff, G.J. Kinne, James Casey, Jaylen Watkins, Jeremy Maclin, Jerry Azzinaro, Jimmy Clausen, Jordan Lynch, Jordan Matthews, Jordan Palmer, Josh Huff, Journey, Lance Briggs, Lane Johnson, Marc Trestman, Marcus Smith, Mark Sanchez, Matt Barkley, Matthew Tucker, Merrill Reese, Mychal Kendricks, Najee Goode, Nate Allen, NFL Preseason, Nick Foles, Philadelphia Eagles, Quron Pratt, Rex Ryan, Robbie Gould, Roc Carmichael, Scott Graham, Solider Field, Vinny Curry, Will Murphy, Zach Ertz on August 9, 2014 by drewbalis.